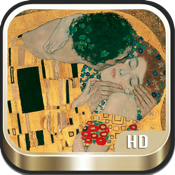 This app is a virtual gallery with complete collection of HD artworks (drawings & paintings) by Gustav Klimt. ★ the largest collection of Klimt's work on the App Store, browse through the collection without internet/wifi/3G connection. Gustav Klimt (July 14, 1862 – February 6, 1918) was an Austrian symbolist painter and one of the most prominent members of the Vienna Secession movement. Klimt is noted for his paintings, murals, sketches, and other art objects. Klimt's primary subject was the female body; his works are marked by a frank eroticism.